We planned to snorkel, dive and relax on the beach here in Ambergris Caye. We couldn't find anything on the Inter-web about birding the island and our Belize field guides are not clear about describing occurrences of birds on the Cayes.. Well, we were pleasantly surprised! 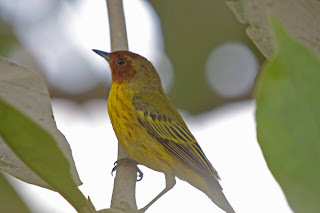 First is Mangrove Warbler. It is listed as a subspecies of Yellow Warbler in some books. This is a White-collared Seedeater. 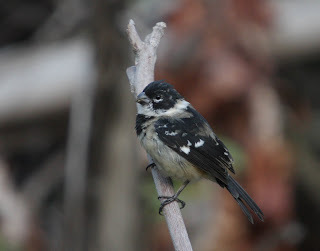 Tiny little bird with a grosbeak beak. More later. I'm just happy to have Internet access. Now back to drinking and laying about. Suckers . . .